Few creatures moved about, and those who did were shielded by darkness of night. When clouds crossed the sky, the full moon that peeked out revealed the movements of little more than slugs seeking shelter under tent tarps. Sounds of gentle snores were muted by the down of sleeping bags which campers burrowed deeply into against the cold of the night. Suddenly, the night was filled with blood curtailing screams. I sat up, fully awake, and I restrained Arayo who was trying to break through the tent walls. "A moose is out here!" yelled my travel companion. "I hear it!" 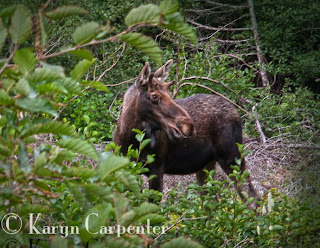 Not sure there was anything I could do to help against the ravages of a 1,200 to 1,500 pound moose that was probably pretty ticked off that a frantic woman had interrupted his early morning stroll through the campground, I opted to stay within my tent. Besides, on the outside chance that he was looking for a bed-time snack of a middle-aged woman, why give him two choices when one was already in the road at his mercy? Actually, I wasn't concerned about a moose for myself or for her, but thought that the challenge of a 100 pound Newfoundland dog might turn the moose from ambivalent to challenged. I offered her my helpful input instead of my physical presence. "RUN!" "But I have to pee!" she replied. "Well, forget the outhouse - just go next to your tent!" I'm sure the other campers were thrilled with this 5 am exchange. Moose are a big concern in Newfoundland, but, like my longing to see a Kansas tornado with the power to relocate entire cities to another state, I also want to come face to face with one of these giant beasts……. Preferably, my face will be sitting in my car at the side of a road. Brought to Newfoundland from New Brunswick in 1904, probably as a practical joke on future generations, the 4 original gigantic animals have gone forth and multiplied to over 150,000. Signs along the road announce the number of moose involved in auto accidents both this and last year and big news on the radio this week concerns one Newfoundlander who is starting a movement to have the entire Trans Canada highway fenced to keep Moose off of it. He has written a protest song against moose and has developed a slogan: DAMM (Drivers Against Moose Madness) that he is going to print on bumper stickers and encourage everyone to post on their cars. Perhaps with enough protest against these 4 legged terrorists, the moose will just hang their antlers in shame and go away. Photos: So far, I've only seen one moose and she was more interested in snacking than attacking. 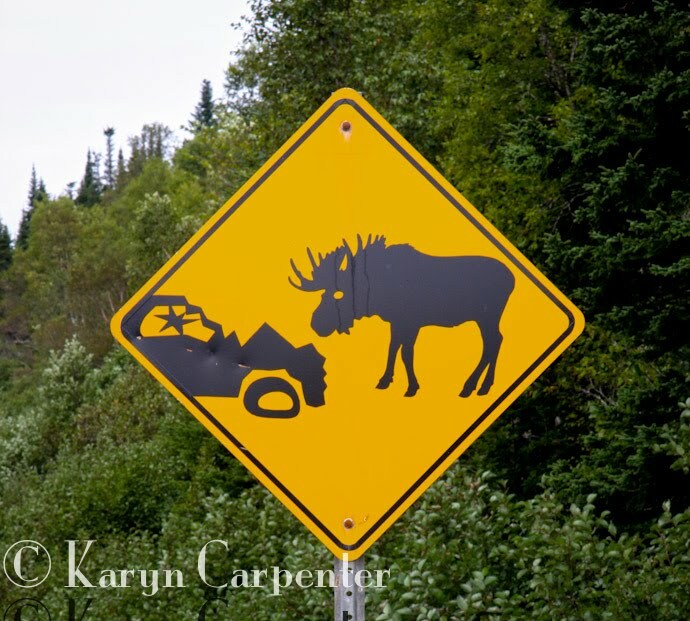 A road-sign warns drivers that they will not win if it comes to an altercation between vehicle and moose. Gotta love those moose, DAMM be damned!